It seems that everything can be live-streamed these days on Facebook including a kidney transplant as shown in the case of a mother in Dallas giving her kidney to her 20-year-old daughter in a surgery that was streamed live on Facebook on Friday from the Methodist Dallas Medical Center. The recipient of the kidney donation is Jessica Gutierrez who was born with congenital abnormalities in her kidney function. Doctors say she will live longer with the healthy kidney from her mother, Maribel. 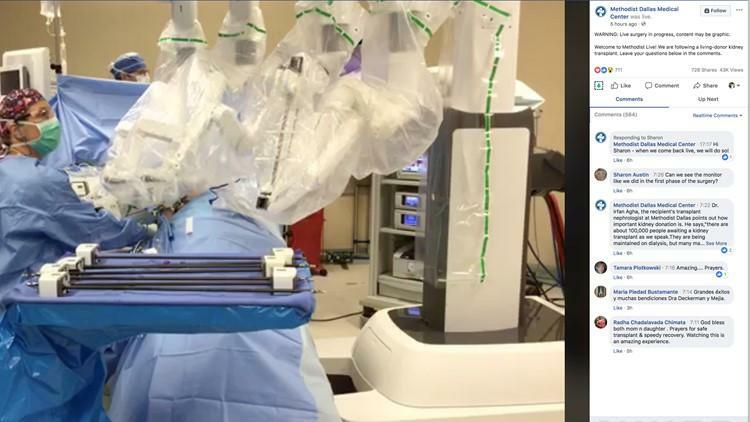 Dr. Alejandro Mejia performed the first part of the surgery using a robot to remove Maribel’s kidney. Transplant surgeon Richard Dickerman then connected the kidney to Jessica. The surgery was streamed live on Facebook garnering thousands of total viewers in a series of Facebook live videos during a span of a couple of hours throughout the transplant process on Friday morning. Wow how cool,,, and how sweet of the mom to do.. i hope they both live a nice long life.. god bless them both..and recover soon..